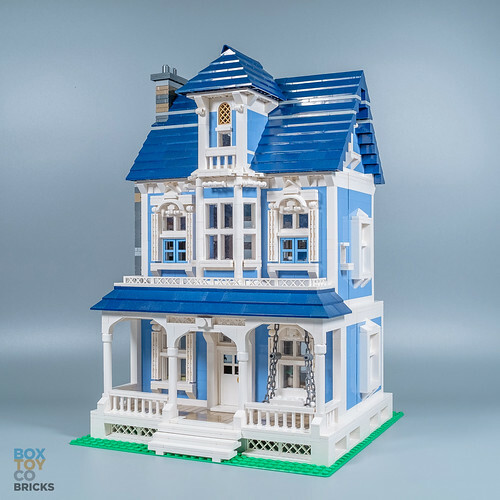 Just sharing our latest MOC The Victorian House, a classic style modular home with lots of nice details and interior finishing. Very nice! I like the cheerful colours, its nice to see something that uses pleasant colours (not overly dark or overly vibrant) and the details and designs used throughout are great! It has quite a bit of texture but doesnt feel at all cluttered. good show! So bright and cheerful. Wonderful job! Great combination of colors. Very effective design and decorative elements, and internal proportions. Excellent work. Nice design. Proves that one doesnt need many colors for a good looking modular! Gorgeous! Love the colours and the details in the facade. I really like this a lot although personally, I would add a non-blue pop of color to the facade, e.g flowerbeds or ramblers. Wow I really like this. Great work. Lovely design. I like the blue and white scheme a lot. Nice façade, with the porch and the first floor windows. Great interior too. I agree with Dazz, above, that some foliage or flowers (or even some furniture or a bicycle) on the porch, and maybe some planters below the first floor windows would help "liven up the pattern". My only bit of critique would be that I'd have preferred the modular approach of detachable floors, and not the fold open style. But still, a great piece of work with lots of neat little details. What a beauty. Love how it opens up. Great fantastic. It would be great live here! Wonderful building! I love the colour scheme and that it opens up. It has a somehow peaceful atmosphere. Really love the colour-scheme. Inspiring build and marvellous porch! As others have already said, the color is fantastic. I'm also a major fan of the music/lighting combo and just subbed to your channel. However, I have to ask- wouldn't the hinges interfere with combining it with other modular buildings? 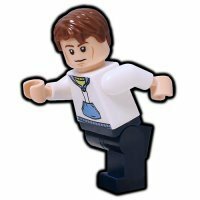 I've had it in my head for a while now that the modulars make a good shopping district, but that a neighborhood area behind them would work well. Sorry for the late reply, for the hinge to work they had to be placed right at the edge of the baseplate so unfortunately it would actually interfere when placed with other modulars side by side as most modular sidewalls are flushed to the edge of their baseplates as well. 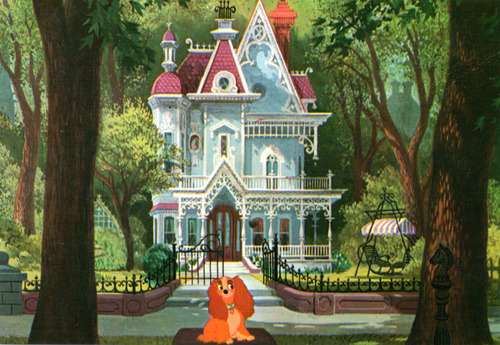 Reminds me of Jim Dear and Darling's house in Lady and the Tramp. Love the medium blue color scheme! Thanks and Glad you love it. Darling's House would be an awesome MOC! Wow this house looks amazing and extremely similar to a house in my town. It's so similar in fact that your color scheme is dead on. I love the swing on the porch. 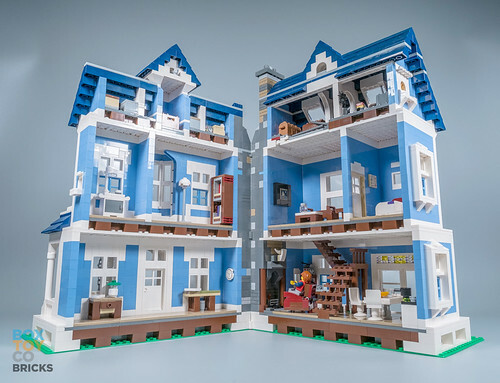 i'm reminded of the Lego house that was destroyed in "Problem Child". Lolz. This is beautiful. I am surprised how the combination of white and medium blue with a hint of dark blue looks like. For sure, I wouldn't expect the blue to have such a nice effect. Moreover, there are many interesting details on the facade. The patterns created on the facade are really interesting, and not too similar to the Haunted house. It's also great to use the hinged wall to show the interior details.